The start of the school year is quickly approaching. Make sure that you have marked your calendars for this week's events. We look forward to seeing everyone soon! All i3 students and families should plan to attend our i3 orientation on August 13th or 14th; that is this Tuesday or Wednesday from 6:00pm–8:00pm. The agenda will be the same each night, so please choose the night that is most convenient for you. We will be going over everything you need to know about i3, in order to have a successful first year. You will also have an opportunity to sign for and receive your scholar's MacBook. Then on August 15th, which is this Thursday, FPC will be having their Freshmen Orientation. All i3 freshmen should plan to attend this event. They will be going over all the school wide important information and handing out 9th grade schedules. This event will be held in the FPC Auditorium at 5:30pm (last names A-L) and 6:30pm (last names M-Z). Be sure to visit the Dining Hall afterward for information on sports and to help yourself to a free root beer float. We also have a few openings left at i3, so if you have any friends that are interested in attending the academy, please have them stop by our table for more information. Finally, this Friday, August 16th from 9:00am-11:00am our sophomores may pick up their schedules from the FPC main campus. 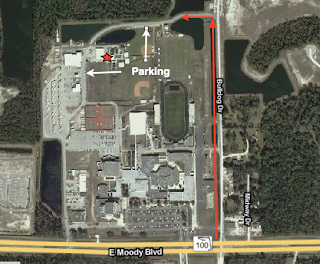 The i3 Academy is located on the far side of the FPC campus, right behind all of the sports fields. The easiest way to find us would be to turn on Bulldog Drive from 100. Then take a left on the street that runs behind our practice football field. This will be your last left before the town center. Once you pass through the gates you will see a group of portables on your left with a blue canopy in the middle of the group, this is the academy. We hope you all are enjoying the last few weeks of your summer vacation. The first day of school will be here before we know it. We have included some important i3 info below, in order to keep you in the loop. Our scholars will be eating lunch everyday at the academy and will not be returning to the main campus for this. Our Food Services staff is currently working on some changes to the traditional high school menu in order to offer some additional, special items for our scholars. The regular lunch will be available for $2.20, with al-a-cart options ranging from $.50-$4.50 and don't forget that breakfast is always free. Our free and reduced lunch application can be found at: https://mealapps.flaglerschools.com/lfserver/EFORM You might also want to check out https://paypams.com/ to set up an account that will allow you to make payments and view your scholar's meal account balance. We hope to see everyone out at our i3 Orientation on August 13th or 14th at 6:00pm. The agenda will be the same each night, so please choose the night that is most convenient for you. During this orientation we will be covering all i3 Academy specific topics. You will also need to attend in order to sign for and receive your scholar's MacBook Air. Please meet us in the i3 Dining Hall for this event. We will be sending directions as this date nears. Then on August 15th at 5:30pm (last names A-L) or 6:30pm (last names M-Z), we hope to see our freshmen families out at the Flagler Auditorium for our FPC Freshmen Orientation. This night will be filled with everything you need to know for a successful first year at the high school. We do understand that this means two evenings spent at FPC for our freshmen, but it will be well worth it. On August 16th our sophomores can pick up their schedules at the FPC main campus from 9:00-11:00am. If you signed up for Honors English I or II, don't forget to do your summer reading. More info can be found at: http://www.flaglerschools.com/fpchs/summer/index.htm. And finally, those of you that like to shop early, below is a list of school supplies that your scholar will need for i3. The school year hasn’t even started and yet we are already sure that we have the most amazing students. Last week we had the pleasure of hosting our i3 student Architectural and Design Committees. As we move forward with the preparations for our opening in August, we know that the success of our students is our number one priority, so it only makes sense to give them a voice during this process. Each of our committee meetings began with a tour of the campus and a discussion of what it really means to be an i3 student. Then our conversations turned to some of our architectural and design needs. We have some unique spaces here at i3 and very much want some student input on how these spaces get setup and eventually used. We are currently looking at creating some small group breakout rooms and a production lab. During the meeting, our Architectural Committee scholars gave honest and meaningful feedback on some of our ideas and even shared some of their own ideas that they had been working on. It was exciting to find out that many of our ideas seemed to be aligned. It looks like our first Design Committee priorities will be our student t-shirt designs and the design of our front gate. Both of these projects will be a great opportunity for our scholars to really make a lasting impact on our academy. We would like to thank these scholars and their families for giving up part of their valuable summer to join us on these new endeavors. i3 scholars if you were unable to attend our first meetings you are still welcome to join us for our next one. Be sure to call or email for more information (386-437-7540 ext. 6124 or sandsk@flaglerschools.com). Thank you for your continued support! A few weeks ago, our facilitators had the opportunity to attend the New Tech: New Schools Training in Grand Rapids, Michigan. Facilitators from this year’s 20 or more brand new, New Tech Schools from around the country were in attendance. This training was jam packed with new teaching strategies and protocols that are part of the New Tech Project Based Learning approach to the curriculum. A really cool and unexpected part of the training was the presence of student voice. Current New Tech students were there to share their side of the story and offer meaningful feedback on our ideas and attended many of our sessions. We were also able to network with other experienced New Tech facilitators and coaches, from around the country, who will be supporting us on the coming journey. These five training days were among the longest and toughest we have ever attended. This trip has enabled us to grow professionally and even closer together as a team. We are grateful for this opportunity and definitely left this training bursting with new ideas and an excitement about the coming year. Even though it is summertime, we are busy getting everything ready for our opening this August. Our facilitators are hard at work planning some very exciting projects that will engage our scholars while helping them to bridge the connection between school and the real world. Our Guidance and Administrative staff is currently working on creating our scholar schedules for next year. We do have about 20 student openings left, so if you happen to know anyone who might be interested in attending the academy please send them our way. Once we reach 130 students or the first day of school, we will no longer be accepting applications. We are currently looking for i3 scholars that would like to take on some leadership roles within the academy. Our first opportunity will be for our scholars to volunteer this summer to be part of our Architectural Committee. This group will help us make important decisions about the layout, furnishings, and decorating needs of i3. The second opportunity will be for some of our creative scholars to join our Design Committee. This group will be working on designing our school shirts and signage. If your scholar is interested in either of these opportunities please email us at sandsk@flaglerschools.com or call us at 386-437-7540 ext. 6124.
i3 New Tech Academy Open House: August 13th and 14th at 6pm - Choose one, as agenda will be the same each night. Inspired by the many great teachers that invested themselves in my life, I decided at a very young age that my true calling in life was to become a teacher. After graduating with my BS in Elementary Education from UCF in 2002, I began teaching in Seminole County, Florida. Since then I have also had the opportunity to teach in Duval and now Flagler. In 2013 I graduated with my MS in Education Media Design and Technology from Full Sail University. About 4 years ago I made the switch from elementary school to high school and I couldn’t be happier. There is nothing quite like getting to be part of my students’ lives just as they are taking their first steps into the adult world. I currently teach 8 different technology classes at FPC; three levels of Web Development, 3 levels of PC Support, App Creation, and even Yearbook. Then after school, two days a week, the fun continues with Computer Club and Video Game Club. Over the years I have also taught countless professional development workshops for teachers, on everything from reading strategies to technology integration. Along the way, I have also managed to marry my soul mate, Jason, who has put up with the insanity that is my life, for the past 13 years. We have two beautiful daughters, Zoe (11 years old) and Hailey (7 years old), who are both enrolled in Flagler County Schools. I am one of those strange people that loves learning. I enjoy learning about the new trends in technology and ways to become a more effective educator. In the rare few moments of spare time that I have, you can find me enjoying a FPC football game, taking pictures of school events for the yearbook, writing letters of recommendations to businesses and colleges for my students, shuffling my two girls to and from cheer, dance, and track practices, enjoying a day at the beach, and if I’m really lucky, reading a good book. I am super excited about the opening of the i3 Tech Academy next year and I am very much looking forward to my role as the program coordinator. I have been part of a team in Flagler County Schools that has been working, for the last year or two, on rethinking education in Flagler. We have been working on ways to harness the power of technology to break free from some of the traditional molds, in order to better prepare our students for life in the 21st century. We believe that the New Tech model is just what we have been looking for. The New Tech Network has been working on this very same idea since the mid 90’s and has had fantastic results. So next year we will bring you the i3 Tech Academy at FPC, based on the best of both worlds; the New Tech model and top-notch educators from Flagler Schools. Everyday I wake up and am thankful to be part of the FPC Bulldog family and now my new i3 family too! I am very much looking forward to meeting all of you and beginning our year together. When I was 16, I moved to Palm Coast from New York and went to FPCHS; I graduated in 1990. When I was 23, I began my college career. I obtained an Associates degree in paralegal studies from Keiser University, a Bachelors degree in religious studies from Stetson University, and a Masters degree in reading education from Nova Southeastern University. After my Masters degree, I began teaching at FPCHS. For the last eight years, I have taught a variety of subjects: English, Creative Writing, and Reading. I am certified to teach Reading, English, Social Sciences, ESE, ESOL, and Elementary. I am so excited to be part of the i3 Tech Academy. I know my students will also be very excited about our academy and what they will learn while they are there.